The Tibetan Terrier is a very sweet and gentle breed. It is very friendly with its owners and family. As a companion, it is wonderful and can be a great indoor-dog as well as a great outdoor-dog. It loves adventure and loves to play in big open fields. It also enjoys sitting and playing in the yard, as it loves to be outside. Indoors it tends to be more calm and will catch a nap wherever it is nice and cozy. It loves to please its owner and family members and is very sensitive at times. It is a great breed for any family that has children because it gets along very well with kids. Also, due to its energy level, it can keep up with kids as well! They make great partners. Taking care of a Tibetan Terrier is fairly easy. Because of its adventurous, curious side, it needs to be allowed to run around and explore new things every day. It does require daily moderate exercise as well. It can be exercised in your yard, if it is fenced in, or if it is taken on a long walk while using a leash. It can also be taken along for a short run, but may not have a very high stamina; it tends to have smaller, intense bursts of energy. Its coat needs groomed at least twice a week because it has a long coat. 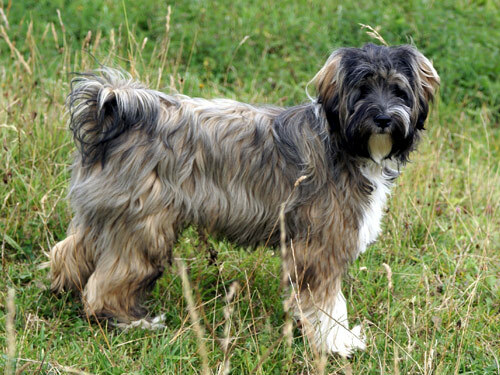 The Tibetan Terrier, like most breeds, does have its own various health concerns that tend to target this pup. On a more serious level, things like lens luxation and PRA are often found and these can be very threatening to the dogs everyday health. Some minor concerns that do not cause as much damage as the aforementioned items, include patellar luxation, cataracts of the eyes, Chronic Hip Dysplasia, croid lopfuscinosis, and hypothyroidism. These are scene is the Tibetan Terrier pretty often but they are not a huge threat. However, they do need to be taken seriously and tended to if your terrier begins to show any signs of developing any of these conditions. Sometimes, owners will see distichiasis but that tends to be rare. Suggested tests for your pooch include eye tests, hip tests, and thyroid tests on a semi-regular basis. This will track your dog’s health so you can be red-flagged if there are any sudden changes. If you keep your dog healthy, he will live for anywhere from 12 to 15 years! The history of this breed is quite fascinating as it was initially bred in monasteries almost 2000 years ago. They were regarded as family members and occasionally helped out herding the family animals. However, it was not a worker. They were known to bring good luck to their families and were coined “holy dogs.” There are many urban legends about how this breed came to be, but they are only myths. The breed was first recognized in India and eventually came to America in the 1950’s. It was admitted to the AKC in 1973.